CENTRAL GREECE & THE PENINSULA OF PELOPONNESE ARE JOINED BY WAY OF THE ISTHMUS OF CORINTH; IT IS ONLY BECAUSE OF THAT BAND OF LAND THAT PELOPONNESE IS CONSIDERED A PENINSULA AND NOT AN ISLAND! The Isthmus of Corinth is an engineering marvel: it is 6.3 km (4 mi) long and 21.3 m (70 ft) wide, with vertical sides rising 90 m above water level. IN THE PAST THERE WAS NO SEA CONNECTION between the Saronic Gulf and the Aegean, whoever wanted to go from one to another by sea would have to circumnavigate the Peloponnese. That meant an extra 185 nautical miles. THE IDEA The notion of cutting a canal through the Corinth Isthmus was first conceived in 602 BC by Periander, the tyrant of Ancient Corinth. THE ALTERNATIVE As the technical requirements were enormous, Periander opted to built a “diolkos”: a paved slipway connecting the two edges, on top of which slaves would pull the ships, back and forth. THE PIONEERS The Roman Emperor Nero was the one to struck the first blow in 66 AC, but soon deserted the notion. Alexander the Great, Julius Caesar and Caligula also toyed with the idea. THE KICK-OFF Construction started in 1881 but was abandoned due to geological problems. 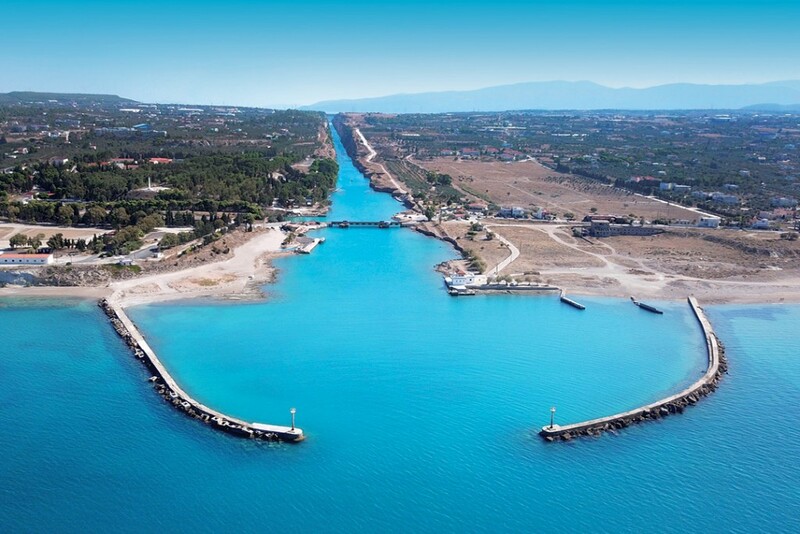 THE COMPLETION It took 2,500 years from conception to completion, as the Corinth Canal was only made possible in 1893!